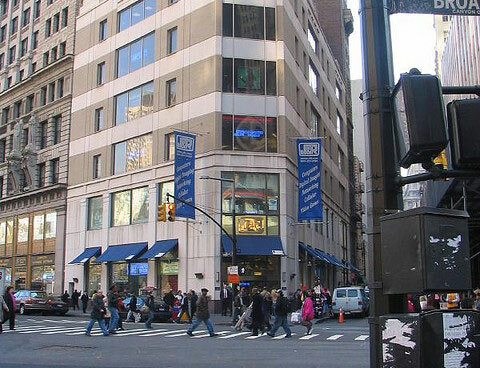 It’s not hard to miss J&R Electronics and Music World–it only takes up an entire city block in lower Manhattan; mere footsteps away from the WSorld Trade Center site. One of Guild’s newest dealers, J&R has only been in the musical instrument business for two years now, even though the enormous retailer itself is celebrating its 40th anniversary this year in the heart of New York’s historic Park Row retail music district. Store manager John Keenoy knows his Guild history, too. It’s not lost on him that Park Row figures significantly in Guild history–that’s where Guild founder Al Dronge’s original shop was in the early 1950s. “It’s very interesting that one of the first Guild dealers stood right here in Park Row way back when,” Keenoy said. Indeed, Dronge founded Guild in Manhattan in 1953, and moved the company to nearby Hoboken, N.J., in the mid-1950s. J&R picked up Guild about a year ago because the retailer’s recent entry into musical instruments had proven successful and they knew they were ready to move up to a top-notch acoustic guitar line. And a great fit Guild and J&R have turned out to be; a success that Keenoy attributes to the quality of the guitars and their lush, resonant sound.